The State Bank of Pakistan Banking Services Corporation (SBP BSC) now looking to hire suitable candidates at the posts of Officer Grade (OG-1). The application forms are needed to be filled online through the official website of Sate Bank of Pakistan. Fill all the details required in the form, take a printout of it and submit the application to the authorized department till Monday, 11th March 2019. SBP Banking Services Corporation (SBP BSC) was established in 2001 as a wholly owned subsidiary of State Bank of Pakistan. As an operational arm of State Bank, SBP BSC is engaged in managing currency and foreign exchange operations; providing banking services to the government, financial institutions and general public; conducting development finance activities; implementing export refinance scheme; performing agency functions like sale/purchase of prize bonds, prize money draws, national saving instruments schemes etc. SBP BSC, having its Head Office at Karachi, operates through a network of 16 Field Offices across the country. 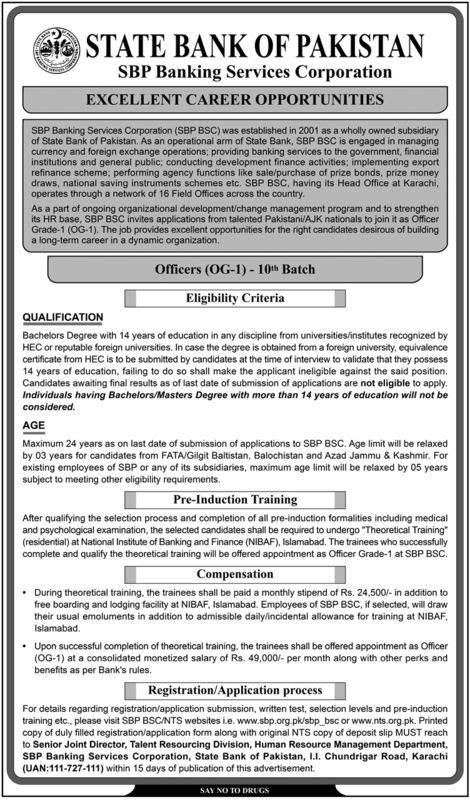 As a part of ongoing organizational development/change management program and to strengthen its HR base, SBP BSC invites applications from talented Pakistani/AJK nationals to join it as Officer Grade-1 (OG-1). The job provides excellent opportunities for the right candidates desirous of building a long-term career in a dynamic organization. SBP State Bank of Pakistan has assigned the National Testing Service NTS to conduct the Recruitment test for them for these jobs 2019 and you can get the Online Test Preparation for the NTS Test to clear. We made all the test for Online Preparation according to the NTS Recruitment test syllabus and Pattern. You can get all the preparation test below. Bachelors Degree with 14 years of education in any discipline from universities/institutes recognized by HEC or reputable foreign universities. In case the degree is obtained from a foreign university, equivalence certificate from HEC is to be submitted by candidates at the time of interview to validate that they possess 14 years of education, failing to do so shall make the applicant ineligible against the said position. Candidates awaiting final results as of last date of submission of applications are not eligible to apply. Individuals having Bachelors/Masters Degree with more than 14 years of education will not be considered. Maximum 24 years as on last date of submission of applications to SBP BSC. Age limit will be relaxed by 03 years for candidates from FATA/Gilgit Baltistan, Balochistan and Azad Jammu & Kashmir. For existing employees of SBP or any of its subsidiaries, maximum age limit will be relaxed by 05 years subject to meeting other eligibility requirements.